I also love a dear friend of mine. Which is why for her birthday last week I decided to whip up a batch of this baked deliciousness and have a nice little birthday brunch get-together. I so needed that time with her. I also apparently "so needed" this baked oatmeal because I couldn't stop eating it. Fatty Por Vida. My sweet friend has some dietary restrictions so I knew I had to make something for her that would meet her "no wheat, low sugar, no cheese" needs. This totally fulfilled that. Totally in love. It bakes so nicely- holds together and easily cuts into square servings. 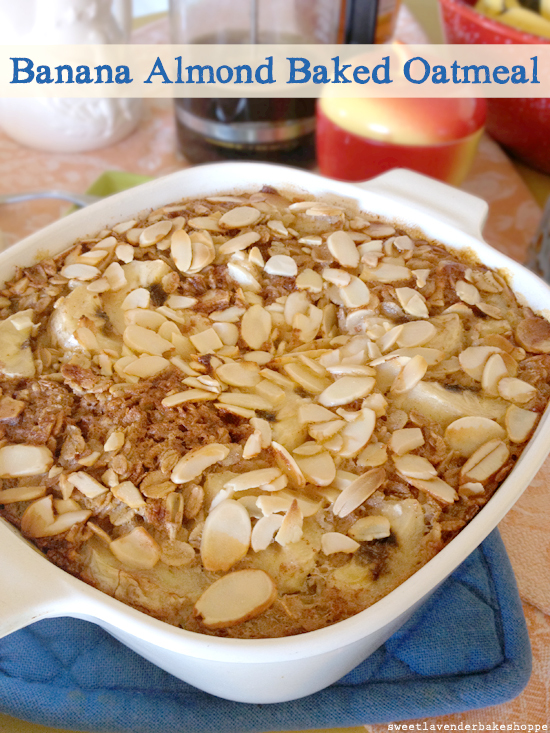 The almonds toast on top while baking AND the bananas caramelize! I don't know about you but I'm a huge fan of that caramelized-cooked-banana-thing. I can't eat pancakes without slices of bananas in the batter for that very reason. The natural sugars immediately caramelize when it hits the heat of the pan. YUM! Well, that same flavor- it's found in this baked oatmeal. Takes about 5-10 minutes to whip up- then the oven does the rest of the work! Perfect for a Sunday morning, brunch, or holiday! **You can replace the three different milks for 2 cups of your favorite kind. 1. Preheat your oven to 375*F and adjust racks to the middle. Butter or grease an 8x8" pan OR a 1 3/4qt glass baking dish (like shown in picture). Set aside. 2. In a medium bowl, mix together your oats, all of your almonds but 2 TBSP, flax, baking powder, salt and cinnamon. Set aside. 3. In another bowl, thoroughly combine your agave (or sugar), milk, almond milk, coconut milk, egg, coconut oil, vanilla extract, and almond extract. Set aside. 4. In your baking dish sprinkle 1/2 of your bananas onto the bottom. Next, top with your oat/almond mixture. Finally, pour your milk/egg mix on top. Do not stir. 5. Gently tap your baking dish onto your countertop- allowing any air bubbles to come to surface. Then top with last 1/2 of bananas and remaining 2 TBSP of almonds. 6. Bake approximately 40 minutes or until puffy, lightly golden brown, and center isn't jiggly. Remove from oven and let sit 5-10 minutes to set. **You can take it one step further and sprinkle sugar on top 10 minutes before baking time is done. Also, a drizzle more of coconut oil on top before serving would be fabulous.